A family adventure to the County Fair is one of our favorite summer pastimes. Corn dogs and carnival rides, fireworks and farm animals; there is something fun for every ranch-hand on your farm at any one of these Bay Area’s County Fairs. Get ready for nightly fireworks and free concerts. The Solano County Fair is a show-stopper! With livestock auctions, the Solano Community Showcase Talent Show, Blue Ribbon Competitions and a family-friendly, traditional county fair-vibe, Solano County Fair is an easy choice for a summer adventure. The Sonoma County Fair is a potpourri of events with something for everyone. Featured events at the Sonoma County Fair range from live music on several stages to horse racing to a full carnival with rides, games and prizes. There’s a rodeo, livestock contest, a special kids area and of course the huge Hall of Flowers (the largest in the United States), which has a different theme every year. The Sonoma County Fair is also a showcase of local arts and crafts. In a nutshell, the Sonoma County Fair is good clean fun on a grand scale. The annual Santa Clara County Fair is coming. Head to the Fairgrounds to check out livestock, a carnival, shopping, entertainment including Twinkle Time, Capt’n Jack Spareribs, a hypnotist/magician + much more! Don’t forget our favorite reason to head to the fair: the fair food! 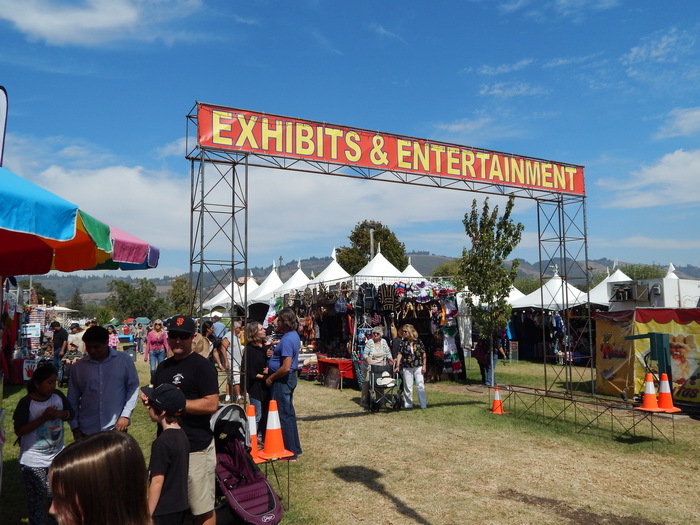 Celebrate the Napa Town & Country Fair located inside the Napa Valley Expo! Come for the delicious food, check out the many competitive exhibits and dance & party all summer night to the amazing entertainment scheduled to perform on the Plaza Stage. Concerts at the Plaza Stage are free with fair admission. In 2017, the Monterey County Fair will be celebrating the 50th Anniversary of the Summer of Love! With exhibits, food, rides and of course, concerts! Concerts are free with fair admission. The Santa Cruz County Fairgrounds host it’s annual county fair and horse show with an emphasis on technology & social media. Previous performers at the Amphitheater Stage shows featured Mickey Guyton, Great White and American Idol finalist & local celebrity, James Durbin! The Contra Costa County Fair offers something for every member of the family. A junior livestock auction, a cookout contest, entertainment, carnival games, roller derby (yep, roller derby!) and more. You won’t want to miss Saturday night’s performance from Jett Benatar, a salute to Joan Jett and Pat Benatar and Sunday’s Fiesta de la Familia Day with Live Hispanic Musical Entertainment. Come out for great entertainment, live music, livestock education, famous fair food & drink and all the Fair flair you’ve come to expect from the San Mateo County Fair! See the pig races, a variety of entertainment, a horse show, a kids train, and all of your county fair favorites. One of the North Bay’s favorite summer events, featuring the hugely popular “Ugliest Dog” Contest, Pig Races, a Safari Adventure, a Culinary Pavilion and Wine Tasting. And rockin’ artists like Tower of Power, Jana Kramer, Loverboy and John Michael Montgomery performing on the main stage. Plus, catch Fiesta Latina featuring Grupo Brisas del mar, Banda Toro and Los Ángeles Negros! Sonoma-Marin Fair concerts are FREE with paid Fair admission! The environmentally conscious Marin County combines the red, white and blue of America’s history with the green of American’s future in sustainability by integrating environmental stewardship at the Fair. One price includes all concerts (featuring The Commodores, UB40, Ann Wilson of Heart and more), fireworks nightly, and attractions and rides. Great family price, great family fun! Fireworks, karaoke, pony rides, a a classic 4th of July parade through downtown Calistoga, nostalgic games, picnicking, wine tasting (this IS Napa after all) are all part of this wine country favorite fair. You won’t want to miss the live music, strolling entertainment, blue ribbon-winning exhibits and displays, barbecue, and not to mention the main event…an awesome fireworks display to celebrate a classic Fourth of July Celebration. Enjoy a special day filled with LIVE Music, Fireworks, Extreme Action Sports, LIVE Horseracing and Great Food. The 4th of July Fireworks Spectacular promises to live up to its name with non-stop, razzle-dazzle fireworks set to music performed by the Oakland Symphony and we will have a Salute to Hometown Heroes Video before fireworks! Show starts at approximately 9:30pm, with best viewing at the Budweiser Grandstand (at the Horse Racing Track). This year, see premium live concert entertainment featuring Sugar Ray, John Michael Montgomery, Ann Wilson of Heart and the Bay Area’s own Shiela E.! All attractions are FREE with admission.